A penthouse in Dublin has gone on the market for €7.5 million, making it the most expensive apartment in Ireland. The roof garden penthouse is part of a residential development at Lansdowne Place, which features four penthouses ranging in size from 1,591 sq ft to 4,240 sq ft.
Three of the units sit atop the Nicholson building, while one is in the Hutchins building. Priced from €2.25 million to €7.5 million, the Nicholson houses the largest apartment in the entire development, measuring a total of 7,700 sq ft of internal and external space on the eighth and ninth floors. The four-bedroom penthouse includes external terraces situated off the living areas, as well as a 1,490 sq ft private rooftop garden, which provides 360-degree views across the cityscape and Dublin Bay. Priced at €7.5 million, the roof garden penthouse is believed to be the largest penthouse ever offered on the market in Ireland. The remaining two penthouses within the Nicholson building measure 1,591 sq ft and 1,978 sq ft, respectively, with two and three bedrooms and each come complete with full-length private terraces of 353 sq ft at the front of the building. The Hutchins building provides a three-bedroom roof garden penthouse with views of Dublin Bay and the Aviva stadium, as well as onto the development’s landscaped gardens. In total the penthouse measures 4,565 sq ft, which includes private terraces situated off the living space and a private roof garden measuring at 1,685 sq ft. In total there are 24 penthouses varying in layout and size, of which nine have been released and sold to date, including a roof garden penthouse in the Blake building, which achieved a record price of €6.5 million. 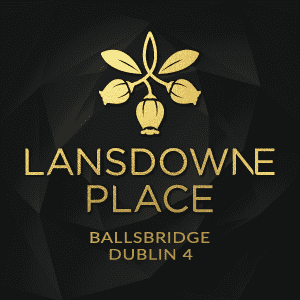 The penthouses at Lansdowne Place feature custom designed Irish craft integrated kitchens and matchbook marble worktops, impressive entrance halls and bathroom suites finished in limestone and marble. Residents also benefit from exclusive access to amenities and services at The Lansdowne Residents Club, a purpose-built leisure facility and 24-hour concierge service with lounge, library, meeting room, cinema room, private dining room with separate kitchen, and a terraced area. The lower ground floor comprises a full-service spa, comprising a gymnasium, fitness studio, sauna, steam room and individual treatment rooms. Designed by architecture practice O’Mahony Pike, the wider development at Lansdowne Place comprises a collection of 215 one, two and three-bedroom apartments, spaced across seven buildings. The development includes garden squares, feature planting, landscaped lawns, seating areas and a water feature, as well as a children’s play area. It is located in Ballsbridge, Dublin 4, which is currently in the midst of a rejuvenation programme, spearheaded by Chartered Land. DealMakerz reckons that despite its hefty price tag, the apartment will be snapped up quickly thanks to its great location and stunning design. This article originally appeared on Deal Makerz.